Simultaneously, in New Delhi, his Defence Minister Manohar Parrikar confirmed in a press interview that G2G was the best option for the acquisition of strategic weapon platforms like the fighter aircraft and the lowest bidder (L1) was decided by “questionable life-cycle cost” factor of which even his UPA predecessor A K Antony was not even so sure. This reminds me of Defence Minister Antony’s Moscow visit in October 2007 to co-chair the annual session of India-Russia Inter-Governmental Commission on military-technical cooperation (IRIGC-MTC) at which the two countries had signed the agreement for the joint development of a fifth generation fighter aircraft (FGFA), with the aim to induct the futuristic stealth fighter by 2016-17. “Why waste so much money on an older 4th generation plane, which will join the IAF almost simultaneously with next generation FGFA and advanced version of indigenous LCA Tejas?,” Dr Konstantin Makiyenko, Deputy Director of the Moscow-based independent Centre for Analyses of Strategies and Technologies (CAST) asked. Although Russian 4++ generation MiG-35 was also a strong contender at that time for the Indian tender, Makiyenko however, argued that it would be prudent to go for a stop-gap arrangement like buying additional Mirage 2000 and upgraded MiG-29 already in service with IAF and divert the funds on the development of FGFA and LCA Tejas to replace ageing MiG-21 fighters. Eight years later, we are coming back to the solution the Russian expert had proposed back in 2007. Defence Minister Parrikar has also not ruled out that to meet the operational requirements of IAF, India could buy more fighters along the G2G route, including additional Sukhoi Su-30MKI, which also fits in the ‘Make in India’ policy as they are already being assembled by HAL. Very few people know the actual tale of the development of state-of-the-art multirole fighter Su-30MKI, where ‘I’ stands for India. It has been hogging the limelight ever since it was first inducted by the Indian Air Force. But there is an interesting tale behind the birth of this warbird; how, for the first time in its history, the Indian Air Force got a fighter jet tailored to meet its specific requirements for decades to come. Not many are aware that, like deadly BrahMos cruise missile, Su-30MKI (Multirole, Commercial, Indian version), is also an embodiment of the vision and foresight of India’s ‘missile man’ and (now former) President Dr APJ Abdul Kalam, who spares no effort in reiterating his immense faith in Russia’s technological prowess. In 1994, ahead of the Moscow visit of then Indian Prime Minister PV Narasimha Rao, Russian state arms exporter ‘Rosvorouzhenie’ (predecessor of Rosoboronexport) invited journalists for a briefing on Indo-Russian defence cooperation. It was a challenging time for India, which was deeply concerned at the absence of critical spares to keep its fighters flying, warships cruising and tanks rolling as the Russian industrial complex lay in shambles in the wake of the collapse of the Soviet Union. Many ordnance factories had gone to the 14 independent states, which broke away from the USSR. In this backdrop the press was told that Moscow was going to offer India its latest Su-30 fighter and the Russian government has invited a senior IAF official to discuss the issue. An old friend, representing HAL in Moscow, argued that no such plane exists and said Air Vice- Marshal S. Krishnaswamy would be arriving to evaluate Su-27 fighter, which was the best the Soviets had developed to counter US F-15 Eagle. Eventually, India signed the initial Sukhoi deal worth US $ 1.8 billion with Russia’s Rosoboronexport (formerly Rosvorouzhenie) State Arms Trading Corporation on November 30,1996 for the purchase of 40 Su-30K planes and development of ‘MKI’ version and its subsequent license production in India. At that time diplomats said that it was a major departure from the ‘buyer-seller’ relationship in defence with Russia and a confident step for transition to joint research and development of cutting edge weapon systems and platforms. It was on August 15, 2002 that I got a call from the Kremlin press office inviting me to a tour of the Sukhoi Design Bureau with President Vladimir Putin two days later. Naturally the invitation was accepted with gratitude. 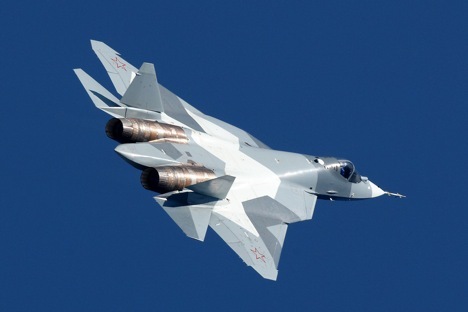 Sukhoi’s T-50 PAK-FA project had just won the race for the development of a futuristic –fifth generation fighter aircraft by defeating its rival MiG’s similar project, and there was a buzz about China and India taking interest in joining the Russian project. “When AVM Krishnaswamy came to our design bureau in 1994, he simply blasted our Su-27 fighter, considered the best in the West. I was very upset, given the fact that I was under probe on the alleged charges of treason for selling Su-27 fighters to China, I was rather depressed. So, I decided not to attend the evening reception hosted by the Indian Air Attaché in honour of Krishnaswamy,” recounted Simonov (1929-2011). “However, my deputy persuaded me to go. I rang the bell of the Air Attaché’s apartment and Krishnaswamy opened the door with a welcoming smile. I saw a flower vase on a side table and was told to bring another of similar size and pour vodka in both of them. I gulped down one vase with vodka and challenged the Indian Air Marshal to follow suit, if he wanted me to come in and have serious discussions. Hats off! He did exactly what I requested and we got down to work and you see the result – the world’s best multi-role fighter. This also freed me from the ‘treason’ charges, since I invested the entire proceeds from the sale of Su-27 fighters to China for the development of absolutely new fighter with multiple roles,” he recounted. “The Su-30MKI is the joint product of Sukhoi and IAF designers and engineers. The rich experience of joint development has enabled us to pick India as the partner in the fifth generation fighter aircraft on the basis of PAK-FA T-50 project,” said Simonov proudly, looking like a hefty Don Cossack out of (Mikhail) Sholokhov’s Nobel prize winning novel ‘And Quiet Flows the Don’ ”. Now with the Rafale knot cut, other projects held up by it, like the FGFA, could be hastened and defence cooperation begin to gather pace.